Lightly spray or grease two of the largest baking sheets you can possible find in your apartment. 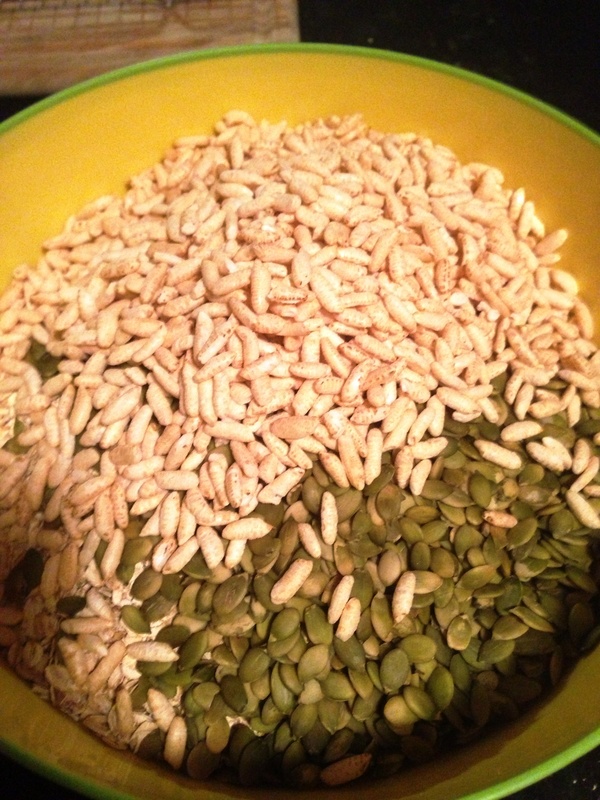 In the largest bowl known to man mix the oats, seeds and puffed rice. I used my “popcorn coma” bowl and it really wasn’t big enough. 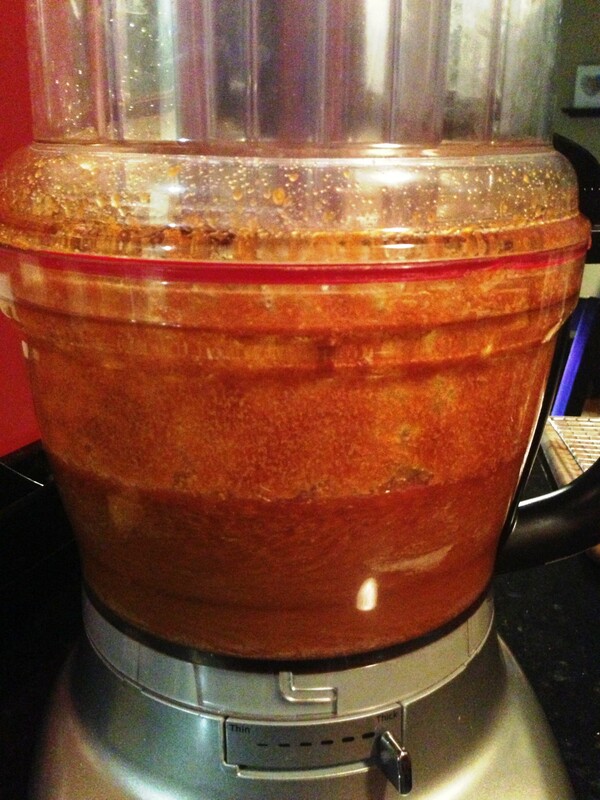 Blend the coconut oil or butter, pumpkin, maple syrup, vanilla, cinnamon, ginger, nutmeg and all spice on high until smooth. I bought the $12 maple syrup bottle pictured above assuming it would be more than enough for this recipe. When I reread the recipe at home and realized it calls for TWO CUPS of this elixir I was less than pleased. 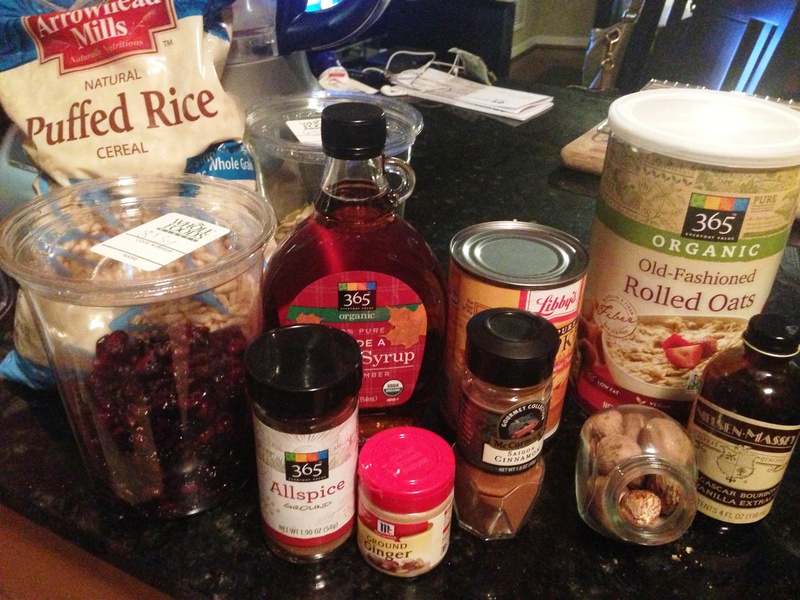 I ended up substituting the remaining required maple syrup with agave nectar. 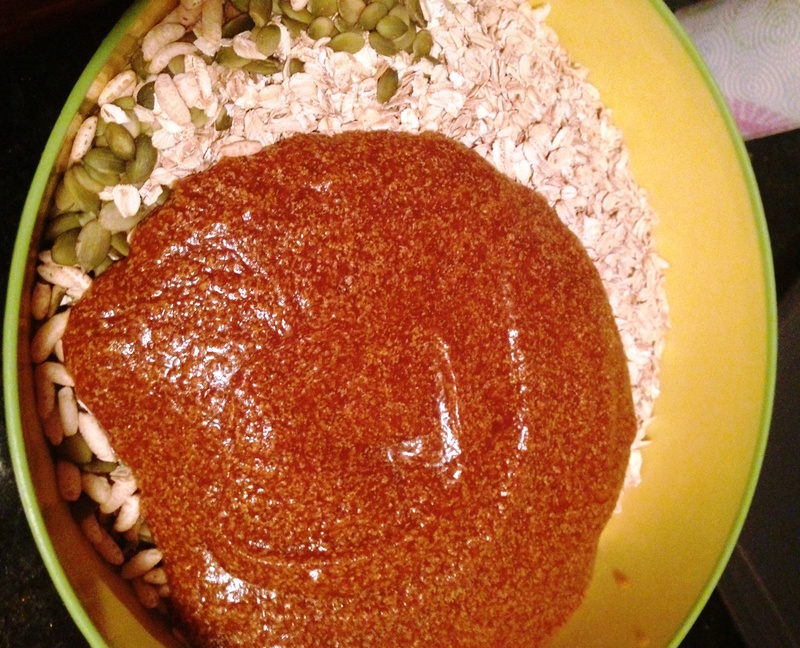 Pour the puree over the oat mixture, stir until evenly coated and there are no dry pockets. 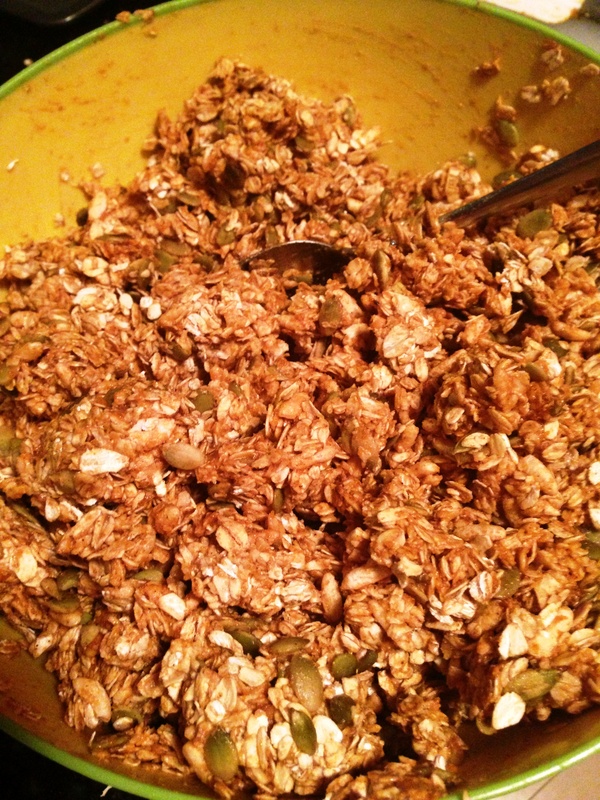 If you have a soup pot or maybe a clean bathtub you could stir this mixture in it would be more ideal than trying to stir this outrageous amount of granola within the confines of a mere bowl. Pat the mixture evenly onto the two pans. It will barely fit and be relatively annoying to do. 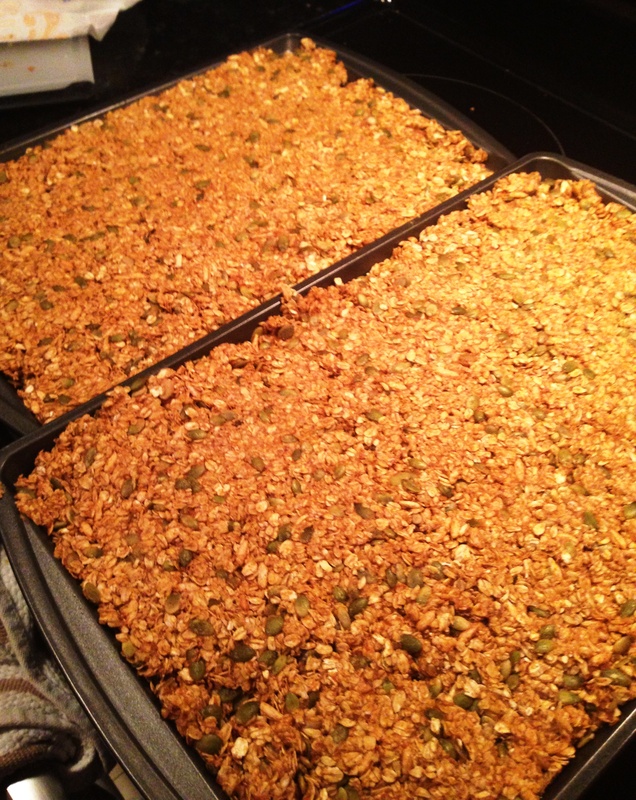 Bake for an hour and a half at 325 F, removing the pans every 15 minutes, and gently inserting a spatula under the granola mixture and carefully flipping it over in sections to keep some clumps in the mixture. This is near impossible, just understand granola will be everywhere and you will be annoyed with me for suggesting you make this recipe. 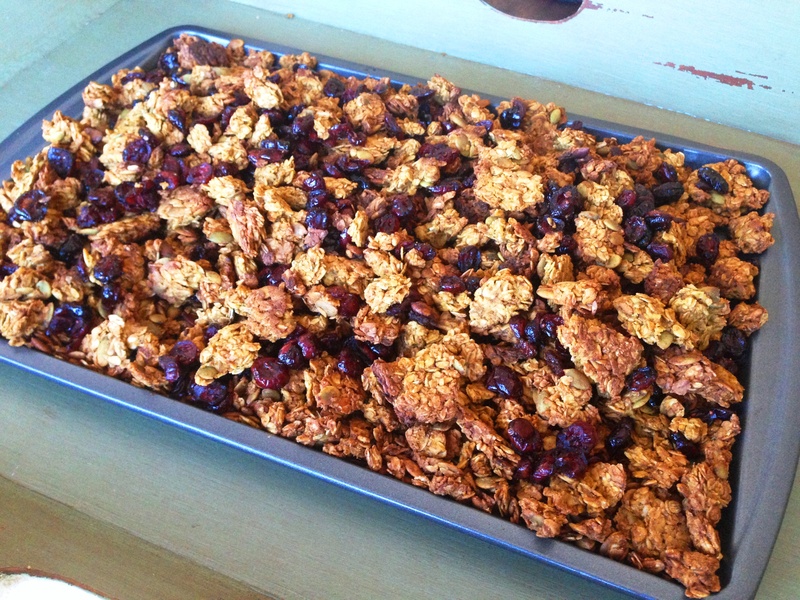 Every other time you flip, be sure to put the granola from the edges into the center and move the center toward the edges to evenly toast the mixture. After an hour, if there is still steam rising from the mixture when you stir it, you should lower the oven heat to 300°F and continue toasting it (still stirring every 15 minutes) until it feels dry to the touch or a piece left on the counter to cool is crisp when bitten into. Basically babysit this granola more so than you would babysit a new born infant. 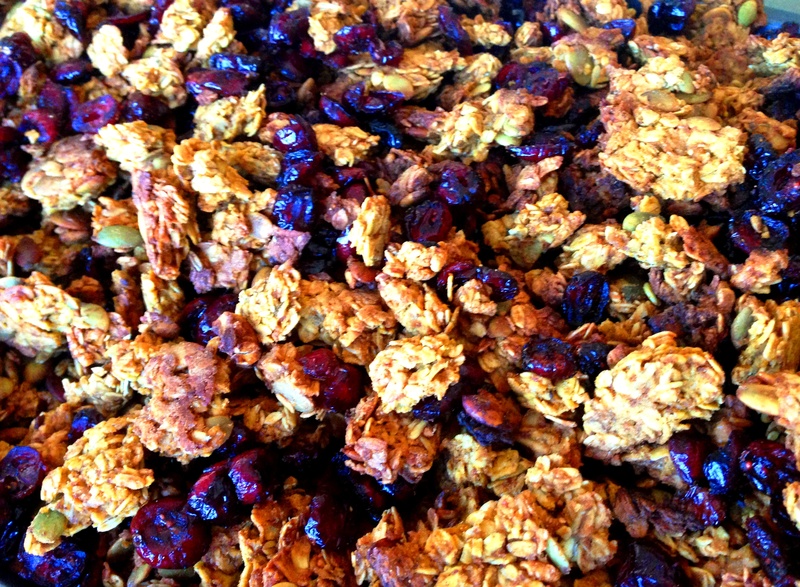 Stir the cranberries into the mixture as soon as it is done toasting. 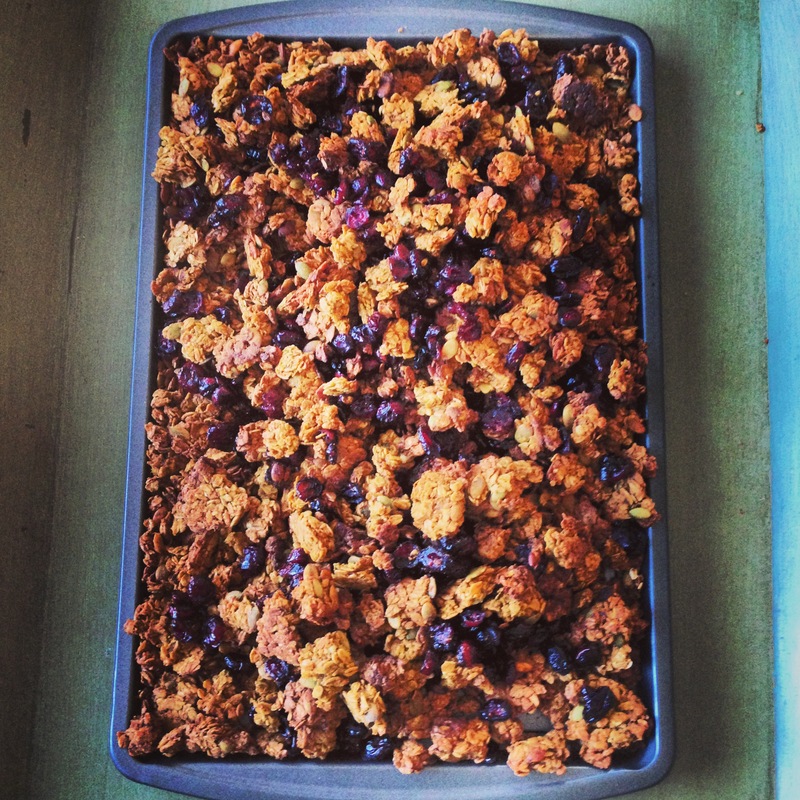 I thought the granola tasted a little weird until it was cooled so don’t panic. It is in fact good and overwhelmingly addicting, I had no issue going through the 2095823095832 pounds of granola this recipe makes.